T-42 Blue Military Grade Threadlocker-Medium Strength: For applications with an anticipated Future Dis-Assembly using Moderate effort on Threaded Fasteners with a diameter up to 3/4" (19mm). Meets Military Specification Mil-S-46163 Type II Grade N. and to ASTM D5363 ANO321. Each bottle contains 50 ml. Wrp comes with a 100% money back guarantee. When you need Premium Threadlockers to help you Win at Work or on the Racetrack, you can Win with WRP. 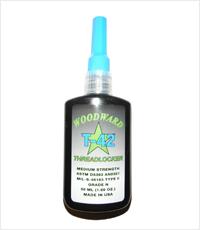 Woodward Race Products Premium Threadlockers use cutting edge technology and Anaerobic Methacrylates Chemistry to bring you the most affordable and reliable threadlocking technology on the Market. We take the very best chemical compounds our Chemists and Engineers develop and go racing with it on our very own race cars. WRP helps increase Efficiency and Decrease Equipment Failure and Downtime. WRP is owned and operated by racers with a passion for winning and we are proud to offer a premium product at an incredible value. WRP Threadlockers are proudly Made in America. At WRP we know from experience that winning is born out of preparation, so join the other racing champions and companies that have made the switch to WRP. Prep with the best Prep with WRP.